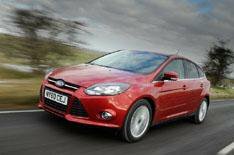 Ford Focus Titanium 1.6 Ecoboost driven | What Car? If you're after a sensible small family car with an emphasis on driving pleasure, look no further than the new Ford Focus. Powered by the 148bhp 1.6 Ecoboost petrol engine, the new car is as sweet to drive down a winding road as you could wish. The engine delivers on every level. It's responsive and powerful enough to be entertaining, taking you from a standstill to 62mph in 8.6 seconds, yet if you're more inclined to cruise at a leisurely pace you can get away with some lazy gearshifts thanks to its 177lb ft of torque. It's economical, too, averaging 47.1mpg and emitting 139g/km of CO2 aided by an engine stop-start system which is only fractionally more than the two lesser-powered 1.6 petrol engines that are available at launch on the Focus. It's also refined, with engine noise shut out at low revs and only building when worked hard. That this is a car with driving pleasure in mind is emphasised by the slick gearshift, progressive brakes and brilliant steering. The electrically assisted power steering system, which brings with it mpg benefits, is brilliantly communicative and accurate, and really encourages you to enjoy the car. The experience is also helped by clever torque vectoring technology, which combines stability control and the brakes to dish out power to the driven front wheel with the most traction. You can concentrate on driving too, because road- and wind noise are subdued, and it's easy to get comfortable behind the wheel. The cabin is slightly smaller than a Golf's but only slightly and the boot space is well shaped and reasonably practical, despite a small load lip that needs to be negotiated. The most significant trade-off to the entertaining driving experience is in the ride, which is a touch hard and can cause the car to jiggle on broken surfaces. That said, the Focus deals brilliantly with larger surface imperfections such as potholes, damping them down rather than allowing them to crash through the cabin. Also, our test cars were fitted with 18-inch wheels, not the standard 17s, which will have made the ride feel firmer. This engine is available only in the top grade Titanium and Titanium X versions. We drove the Titanium model, and it's generously kitted and adds a much more alluring dashboard layout to those in the base level cars with smaller engines. It's still not as classy a place to be as a VW Golf, but the layout is more engaging. As well as the upgraded centre console and cabin materials, Titanium offers gadgets including dual-zone climate control, cruise control and hill-start assist to the already generous kit list, which includes DAB digital radio, stability control, USB and Bluetooth connectivity as standard. So, the perfect driver's car for this class then? Well, certainly for now, but before you lay down that deposit bear in mind that Ford has more powerful Focuses on the way, starting with a 178bhp 1.6 Ecoboost petrol later this year, and with the prospect of even more powerful cars to come in the longer term. That said, the Ford Focus Titanium 1.6 Ecoboost will remain an entertaining choice, especially for anyone keen to keep running costs in check too.